So, the problem with popular races that require you to sign up four months in advance is that I am very optimistic about my future abilities. And there was a time when I could go out for a 7 mile run without much fanfare. Likely, I'd set out just to run and all of a sudden an hour and a half had gone by and I'd been listening to my jams and hadn't noticed. Woops, it's getting dark. Or woops! I missed my fav TV show. Or woops, I'm never going to get to sleep at this point. But no more. Now, it seems about two miles is my peak. I'm out of breath, my legs don't want to go, and my knees hurt. I can elliptical for a good period of time, but my midget legs just won't go the way they used to in college. I peaked early; I'm learning to accept it. In most ways, I'm pretty sure it was in middle school. But, I'll keep signing up for races and being optimistic. There's no better way to realize how far you've fallen then to be surrounded by a bzillion people zooming around you. Then my pride starts to overrule my legs, and there's this internal struggle where college KK tries to fight back against truck KK of today. So, at the Falmouth Road Race this year, I started off like a champ. I was zooming along, passing people, feeling strong and proud about keeping up with everyone. 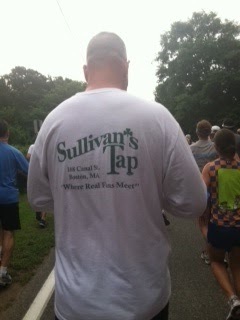 I even snapped this pic of the guy in front of me at the very beginning... Sully's Tap is my jam. I like you. I was full speed ahead for the first 3.5 miles... then the wheels fell off. I could run a song, walk a song. I tried to put on the pumpiest of pump up music, but the blister I got during this race? Epic. The crowds and energy were amazing, especially at the end of the course, but my "how 'bout I don't run and eat my feelings about law school" workout plan would not exactly have done Kanye proud. Whatever. I'm part lawyer now, I'm pretty sure they won't admit you to the bar without being pale and round. And I refuse to be pale, so something had to give, and it was my endurance in running. Falmouth, you were fun, and I think you were a good bellwether to motivate me, but you hurt like ski pre-season, and I didn't miss you. And fun facts? Mr. Sully's Tap, despite me losing him on the course, passing him off the bat, then apparently him blowing by me somewhere when I was sucking wind? I sprinted at the end (gotta look good for my fans) and ended up limping along after the finish line right behind him again. Looks like he and I have similar lifestyles/training plans. I'm A-OK with that.